DC Comics caused quite the stir last week when a number of Joker-themed variant covers were released to the public as a tease for their release in June. One cover in particular for Batgirl #41 showed a devilish photo of the Joker with Batgirl in his clutches. The acclaimed artist behind the dark photo, Rafael Albuquerque who is widely known for his work in American Vampire took inspiration from Alan Moore and Brian Bolland’s 1988 series, Batman: The Killing Joke. The photo sent fans into a fury, and the variant was quick to receive criticism which ultimately led to DC pulling it all together. But, like any controversy, there are two sides and there’s a whole lot more to this story than merely aesthetic disagreements. Variant covers are nothing new to the comic book industry. They’re usually another interpretation of the story found inside the issue, and also an opportunity for the book to drive a sort of collectibility. This year marks the 75th anniversary DC’s most iconic villain and in June, the comic book company looks to celebrate The Joker with a collection of variant covers. So when Albuquerque payed homage to Alan Moore’s famed story, it was a very particular Joker that has upset many fans. The cover that Albuquerque created was questionable, but the controversy lies more in the inspiration behind it. In Alan Moore and Brian Bolland’s Batman: The Killing Joke, Barbara Gordon aka Batgirl was shot and paralyzed by the Joker. Within the storyline, after the Joker shoots and paralyzes Barbara he strips her naked and takes photographs to drive her father (Commissioner Gordon) mad. It is common interpretation that Barbara was sexually assaulted in this progression, though Moore has denied that intention. Paying homage to this specific storyline (which Moore himself has tried to distance himself from) isn’t the entire gist of the controversy though. The bigger issue many are having is that this variant is highlighting a much darker time in the character’s history, which is the complete opposite direction that the current co-writing team of Cameron Stewart and Brenden Fletcher along with artist Babs Tarr have been producing. Many feel this cover to be a digression from the current state of the female heroine whose new storyline is a more optimistic direction with a fresh take on the role of female superheroes who are often overtly sexualized and marginalized. 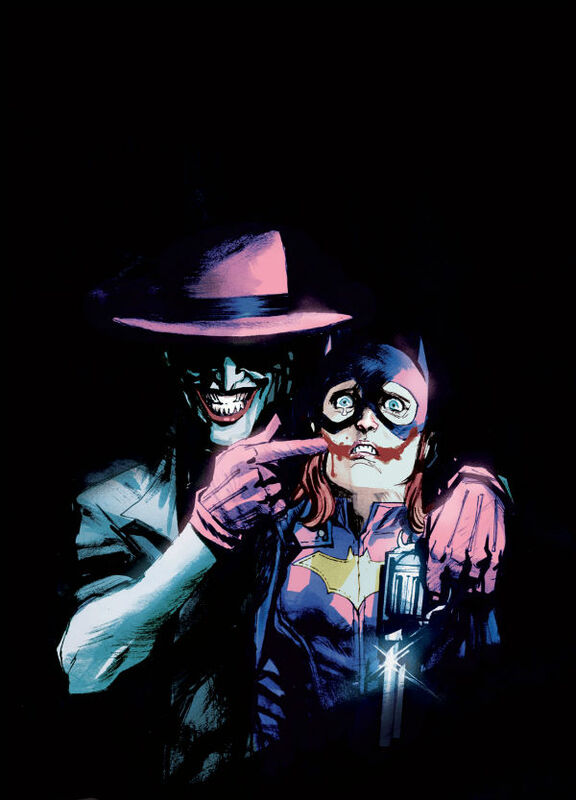 Also, the connection to the questionable Moore storyline has many in uproar that the cover holds unwanted sexual subtext with the Joker holding Batgirl against her will. In response to the violent cover, Twitter users began using the hashtag “#changethecover”, which has been trending since the release on Friday. Many argued that the cover was isolating and inconsistent saying the new series had worked hard to draw more female readers, and this was completely offensive. Even the writers on ‘Team Batgirl’ spoke out about the cover, saying they had not seen or approved it whatsoever, and it went against their intentions with the story. Others found DC’s quick pull of the cover a hinderance on freedom of expression and censorship. And stood by the fact that the controversy existed because of a very small majority of easily offended people. Those who wanted the comic to remain believed that the Joker is a threatening character, and this cover is not nearly as violent as some of the other moments he’s partaken in. Some were even so upset about the pull that they started a online petition entitled “Save The Batgirl Joker Variant. Save Your Freedom of Choice!” which now has a total 294 signatures. My intention was never to hurt or upset anyone through my art. For that reason, I have recommended to DC that the variant cover be pulled. No matter which side you may agree with in this controversial event, it is definitely not the last we’ll hear of it. As more questionable story themes, covers, newly created characters, and other elements of the expanding comic book industry are being introduced, they will be met with some sort of critique from disapproving parties. As for this Batgirl cover controversy, even if the cover isn’t going to run come June, the continuing conversation behind it will probably make it more widely seen than it would have been solely on the shelves.